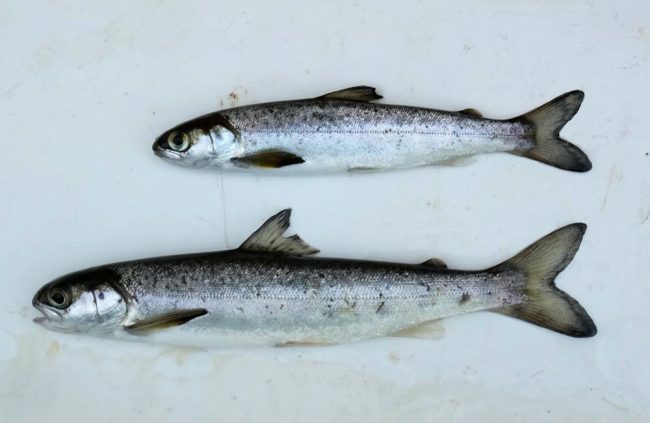 Following issues at Catrine Dam last year during the smolt run, this year we have been monitoring their progress as they head downstream in order to assess output from the upper river and prove (or not) that the fish ladder is working. 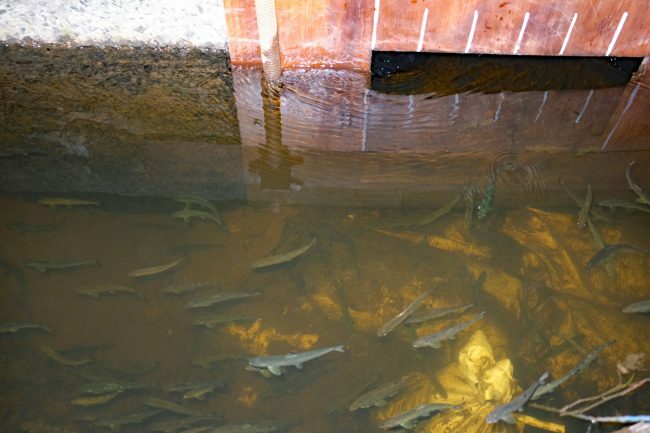 The fish ladder is an essential component of the infrastructure as it is now the only route upstream since the dam was refurbished. There is a counter in the dam that is still in the process of tuning so this with the smolt count and the rod catch should eventually tally up (with a margin for error of course). After a slow start due to the very cold and late spring, smolts have been moving steadily through the trap for a few weeks now. Trout and salmon smolts have been encountered but trout are few and far between. Salmon seem to be building up in numbers but until we finish the count, we are unable to say whether the numbers are good or not. There quite a range in sizes found in the trap but the large majority appear to be S2 smolts (2 years old). 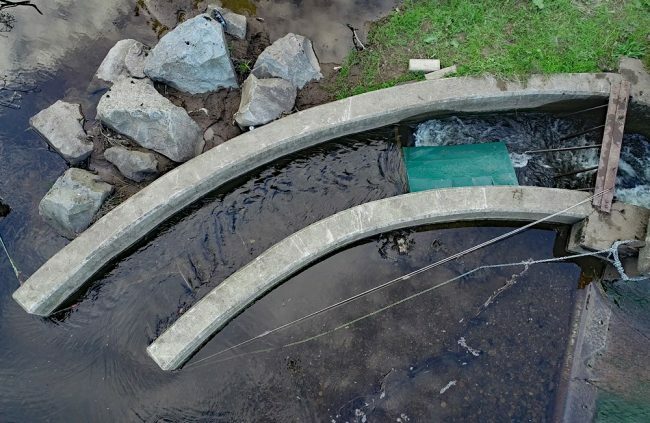 We have a smolt trap built into the dam and have installed a temporary fyke net in the ladder to monitor smolts taking that route. A third trap has been installed in the voes (reservoirs) between the river and the turbines. we put another trap in the voes at Catrine to check that no smolts have managed into the voes past the smolt screens as they did last year. 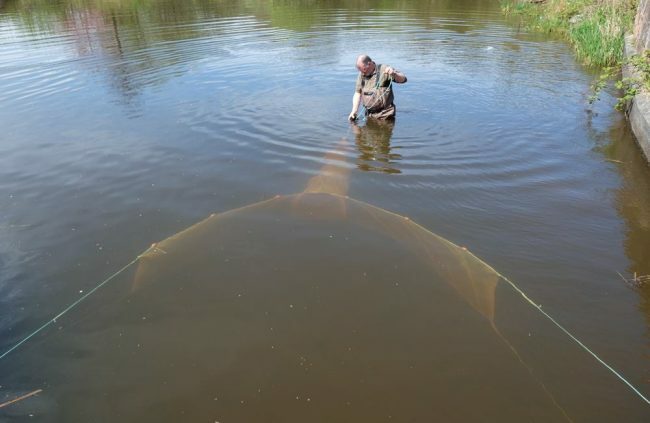 Catrine Community Trust made several repairs to improve the stability and efficiency of the screens since last year following their failure to prevent smolt entry last year. So far, the ladder appears an unattractive route and the screens are preventing all but the occaional smolt entering the voes. With smolt numbers increasing rapidly behind the dam last week, we decided to man the main trap overnight on Tuesday to prevent too many fish builing up as heavy rain was forecast. The rain didn’t really materialise however over 800 smolts were removed from the trap and counted before being released to carry on on their journey. Smolts entering the trap after dark. There are still thousands of smolts waiting to head downstream and we expect numbers to keep increasing until they finally go which normally coincides with the first spate in May.